A new documentary on mental health and the LGBT+ community, from King's College London. 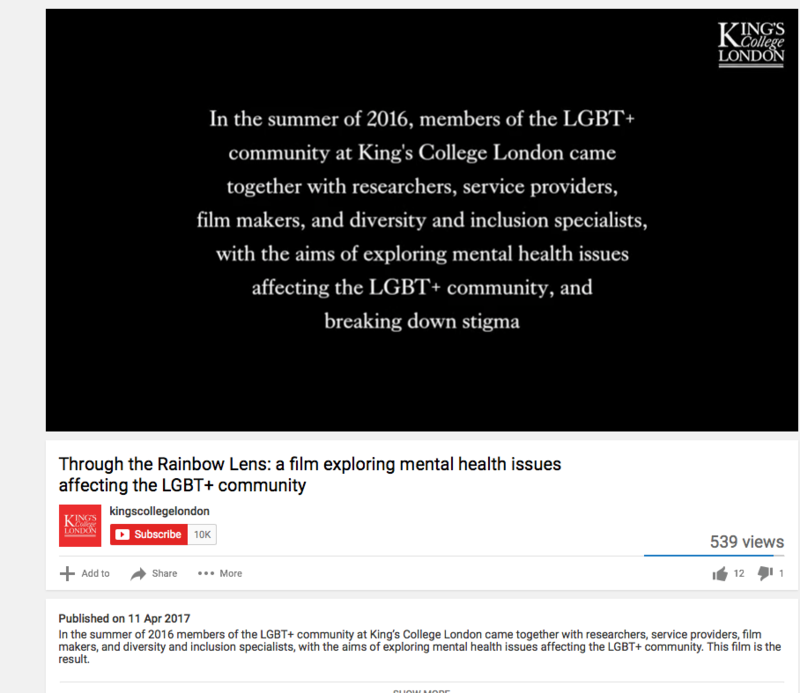 Mental health and the LGBT+ community is the subject of a half-hour documentary made by a collaborative team based at King’s College London and produced by Sally Marlow (one of the associate editors for this section). Through a series of interviews, the film explores a range of topics related to the mental health of a stigmatised community. Its great strength is the range of contributors: drawn from both KCL staff and students, the participants come from a range of sexualities, gender, race and generations. The latter can be overlooked: some of the experiences of student-aged LGBT+ people are inevitably different from those of the older participants, but it’s clear that prejudice is universal. Topics covered include issues around coming out, especially if growing up in a religious culture; bullying, internalised homophobia, structural stigma, micro-aggressions and unconscious biases. There’s recognition of the increased risk factors relating to mental health experienced by the LGBT+ community: for example, the dominance of the alcohol and drug culture for gay men. Participants talk candidly and often emotionally about their experiences. One man discusses seeking out violent partners and his subsequent failed suicide attempt; another, of the effect of the Orlando nightclub shooting in June 2016. There’s also discussion of the issue that, having struggled to come out, some people then feel reluctant to ask for support when faced with a mental health problem. Intersectionality is also touched upon, with white gay men in a privileged position compared with others in the community. This is a powerful and wide-ranging film and essential viewing for anyone in the LGBT+ community, their families, friends and allies, and those who work in mental health. The team at King’s College London are to be thanked for creating this freely available, but invaluable resource.